A friend who just moved from LA to NYC and is very concerned about the cold asked me if it would be okay if she bought a pair of Uggs this winter. This is a cool girl, mind you, who never would have rocked Uggs in Southern California, where they are reserved for sorority girls who like to dress for "winter" when the temperatures drop into the seventies. I explained to my friend very firmly that a) No self-respecting New Yorker would be caught dead in Uggs and b) They wouldn't keep her feet dry anyway. Via the catbird blog. You can't buy them online, but you can buy them at the Brooklyn store. *I do believe shoes are worth investing money in. 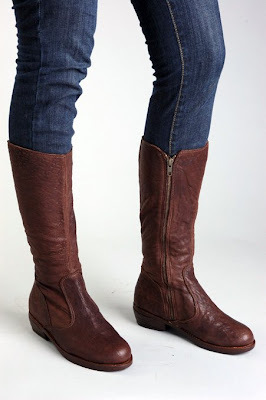 I broke my rule with these, and they turned out to be sh*t.
**It is not lost on me that these boots are pictured with skinny jeans. Skinny jeans have their place. But they would work equally well (better!) with a pair of boot-cut (duh) or wide-leg jeans. In my opinion. Oh I love boots...too bad I can't wear them. Damned cankles. except with the bootcuts they get all bunchy when you tuck them in. hi! i'm getting married in dec, and will then be moving from LA to chicago in the middle of the winter. i'd like to get a pair of leather boots, similar to the ones you posted here. but i heard recently that they'll get ruined in chicago because of the salt they put over the snow. is this true? please help. i'd like to get a pair of stylish boots like you have here, but people are telling me to get snow boots instead. what to do? what perfect, perfect boots. love the colour!! haha. thanks for the help. Hmmm, we rarely NEED boots like this in Texas, but they are really cute. So we wear them anyways! Oh, and I agree about the Uggs. They are and always have been super ugly. And WTF is up with Pam Anderson claiming she didn't know that they were made of sheepskin??? Ha ha ha ha ha ha ha!!! I'm still scared of skinny jeans but the boots are HOT. I wish I could wear boots all year long because they go with almost everything.